The Great Mother Prajnaparamita introduced Kash to the Enlightened One. Kash bowed to the empty space in front. Shri Buddha was invisible! There was no one before him. But Kash knew that the Great Soul was sitting directly in front of him, and not on the left or right, as his palms and fingertips detected very strong vibrations flowing profusely from the Awakened One. Caused by a pollution of ignorance. Of the wings of enlightenment. And distress may be abandoned. Have strayed on to an unpaved road. She is identical with omniscience. She does not stop any dharma. Is the perfection of wisdom. With the gift of self-confidence. She is the antidote to mortality. She is intimate with the ways of Dharma. In early 1994 Kash was requested to obtain permission from the Great Mother to visit Shri Buddha. (Unfortunately, this date was not recorded.) He raised his kundalini, began meditation and instantly reached the Sahasrarapadma, the 1000-petalled Lotus. He bowed to the Great Divine Mother sitting on Her golden jewel-studded Throne. Greetings were exchanged. Kash then expressed his desire to see Shri Buddha. She agreed and got down from Her Throne and stretched out Her Hands towards him. Kash came forward, put his palms above Her open palms and found himself levitated off the ground. They then started traveling at stupendous speed across enormous mind-boggling distances and universes to reach the Pureland where Shri Buddha resides. Soon Shri Mataji and Kash reached the Pureland of Amitabha where Shri Buddha was sitting all alone in deep meditation. They walked a short distance and sat down before Him. 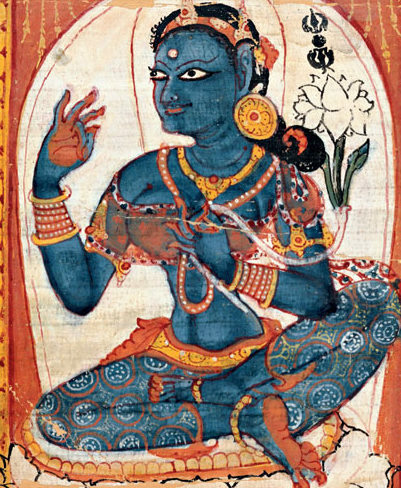 The Great Mother Prajnaparamita introduced Kash to the Enlightened One. Kash bowed to the empty space in front. Shri Buddha was invisible! There was no one before him. But Kash knew that the Great Soul was sitting directly in front of him, and not on the left or right, as his palms and fingertips detected very strong vibrations flowing profusely from the Awakened One. This Spiritual Energy informed him the exact spot where the invisible Shri Buddha sat. In his own Sahasrara this Cool Breeze was assuring him that Shri Buddha, even though invisible, was before him. A self-realized child was demonstrating the spiritual senses now available to all humankind and awakening them to this New Consciousness of the Millennium. 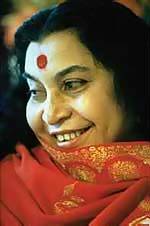 Shri Mataji then requested for meditation. All three of them raised their Kundalinis and, with their open palms resting on their knees, went into Sahaj Samadhi. Kash experienced a very ecstatic state of Nirvana as the intense free-flowing Paramchaitanya engulfed him from head to toe. Wave after wave of Celestial Bliss continued flowing through his spiritual body, saturating him with inexpressible joy. This thoughtless state was beyond any description. Time ceased to exist. Duality became an illusion. Nothingness was Nirvana! Emptiness was Joy! Oneness was Bliss! It was the state of Shunyata! After a undeterminable period of meditation Shri Mataji must have either tapped Kash on the shoulder or called out his name, and Nothingness became Consciousness. He bowed to Shri Buddha and thanked Him. The Awakened One bowed back. Kash stood up and followed the Divine Mother back to the Land of Eternal Light. After arriving he asked permission to leave, and bowed to Shri Mataji. As he closed his spiritual eyes the Reality of his Self in the Pure Land instantly became the illusion of himself, along with billions of fettered humans, toiling in this endless samsara on Earth. Meanwhile his father was waiting in the living room to know what had transpired, which was by now a daily routine. There were also many questions to ask about these mystical journeys. After a while he realized that Kash was taking too long to come out of the meditation room to explain about his experience. This was unlike him. So, after a few more minutes of waiting, he went into the meditation room. He found his son lying in a fetal position with mouth slightly open, still in bliss. His father questioned him, inquiring if he did see the Buddha. There was no answer. After a few times of questioning Kash finally opened his glazed eyes and barely mumbled that he did, an effort that took considerable concentration. He whispered a few times, "The vibrations are too much, the vibrations are too much, the vibra ...," before lapsing into a spiritual coma again. There was nothing his father could do. He just eased the limp limbs of his hapless son into a comfortable sleeping position, arranged the pillows and comforters under and around him, closed the room door, and left. After about an hour Kash finally managed to get up and stumbled out of his room groggily, swaying ungainly like a drunk. The Celestial Bliss was still flowing from him, eyes shimmering with spiritual light. He lurched onto the living-room sofa and crashed onto it, explaining that he still could not steady himself as the mystic experience had really intoxicated him. Kash later described to his father all that he had witnessed with Shri Buddha. He ended his narration by saying that after he had bowed to Him, the Awakened One bowed back. His father was puzzled. Shri Buddha was invisible; so how did Kash know that He had bowed back? Kash replied that as Shri Buddha bowed there were strong vibrations going down from his own forehead till the chest, stopping there momentarily, and going up again. Kash's spiritual senses acknowledged that the Enlightened One had bowed down, and then put His head up again. Moreover, in the Spiritual Heaven all of them are extremely courteous and respectful. Thus, the question whether Shri Buddha bowed back or not does not arise. But the vibrations from Shri Buddha were just too strong on the first day, compared to other Divine Beings. The only other time he felt the same intensity of vibrations was when he met Shri Krishna for the first time. This happened after the Blue Lord was invited to join in the morning meditation with Shri Mataji Nirmala Devi and Her Son, Shri Ganesha. During the initial months of meeting the Adi Shakti and various messengers in his own Sahasrara (Kingdom of God) Kash at times had headaches and stomach cramps. He often slumped straight from meditation into sleep, at times for an hour or two, before he could get up. Even then he would be groggy and that effect sometimes last as long as 24 hours. There were even times that he had to miss school. Over subsequent visits Kash was able to absorb the vibrations without any side effects. Note: Prajnaparamita, the wisdom (prajna) that has reached (ita) the other shore (param) is the wisdom that leads to complete awakening. “The Joy of the Sahasrara is called as Nirananda since long, since ancient times called as Nirananda or Nirmala-ananda. So many call it as Nirmala-ananda or Nirananda. Sudha-sagara-madhyastha (61st): She is in the centre of the Ocean of Nectar. She is the abode of Bliss. It is the Bindusthana of Sri-Chakra also the Dvadasanta, from where nectar is said to flow through al the nerves of the devotee, if he has Her Grace. Sudhansindhor Madhye (Saun-Lah-8). You have to see how He first felt that one has to seek something beyond life ... He couldn't understand how this misery has come and what is the need to have this misery. So He gave up his family, He gave up His luxuries of life — everything He gave up — and went in search of the Truth, as many of you have done. He would have been lost also I would say because He had read all those Upanishads, and He read all the books that were possible for Him to say what the Truth is. But He couldn't get anything. He was a complete sanyasi in the sense that as far as the food is concerned, as far as the entertainment is concerned, everything He gave up and ultimately the Adi Shakti gave Him Realization because He was so true, and was one of the one marked for a special place in the Virata. He had to achieve that. Of course I need not tell you about His previous lives; perhaps in so many of My lectures I have already talked about it — what was His previous life and how He achieved His own enlightenment about Himself. Chunmayi (251st): Of the nature of Consciousness. "Buddhist cosmic eschatology acknowledges its Hindu roots, with the belief in a cycle of creation and destruction. In fact, the Buddhist sacred text, the Sutra Pitaka (discourse basket) from the first century B.C.E., applies the cosmological cyclical thinking to the state of Buddhist spirituality in terms of decline and revival of Buddhist teachings. The historical Buddha (the enlightened one, Shakyamuni or Gautama) apparently predicted that his teachings would disappear after 500 years. According to the Sutra Pitaka, the "ten moral courses of conduct" will disappear and people will follow the ten amoral concepts of theft, violence, murder, lying, evil speaking, adultery, abusive and idle talk, covetousness and ill will, wanton greed, and perverted lust resulting in skyrocketing poverty and the end of the laws of true dharma (in Buddhist use the religious teachings about the ultimate order of things). During the Middle Ages, the span of time was expanded to 5,000 years. Commentators like Buddhaghosa predicted a step-by-step disappearance of the Buddha's teachings. During the first stage, arhats (worthy ones or saints, in Theravada Buddhism devotees who attain the ideal of spiritual perfection) would no longer appear in the world. Later, the content of the Buddha's true teachings would vanish, and only their form would be preserved. Finally, even the form of the dharma would no longer be remembered. During the final stage, the memory of the Buddha himself would vanish. Buddha did not deny God's existence. He denied the limited perceptions about what that existence is. thanks for the excellent research and commentary.... but again, it goes to semantics in India, in its theological history and etc. In Western theology there is a list of 13 archangels and that list has a hierarchy of power. I think the more well known ones like Michael and Gabriel are about half-way down the list. Indra refers to the being at the top of that hierarchy. I forgot his Western name, I know a couple of the ones near the top are Sandalphon and Metatron (sorry, spelling may be off a bit). Yes, the Buddha did mock the religion as it was practiced by these "Pharisees" of his day - these faux ascetics. But he did not mock the real ascetics...and it is quite a challenge, wading through the Vedantic theological subtleties to see the differences. And the other statements you made, about Buddha and God are also in this context....the difference being him commenting on the limited views about God...that is true. He is not denying God's existence. He is denying the limited perceptions about what that existence is. And he is going into complex Vedantic theological subtleties to do so. One really has to be quite versed in, say, the difference between Kali and Parvati (who are the same being) to understand the emphasis, metaphor and illustrative value to the teaching. That is why the phrase "Great God" seems to refer to the Supreme Being, when those in India at the time of his teaching would immediately recognize this as a reference to Indra. You know, in the same way that if someone in New York referred to the "lord" of the Yankees...they would know it is a sarcastic reference to George Steinbrenner and not a reference to the deity that the Yankees worshipped. One has to know the culture of theology in India, the culture of theology in popular view in India at the time, the culture of theology of the true ascetics in India at the time, and the culture of the (fadistic and cult-like) faux ascetics of the time, in that era, in India. Unfortunately, it really is that complex to fully understand the references. In India there is a pervasive kind of superstition based religion and then there is, say, the priesthood's version of religion. And the difference is like the difference between Santeria and Christianity. It is that dramatic. The ascetics in India have always included some "survivalist" kind of lunatics...as well as deeply religious hermits. The Buddha's audience was familiar with all these distinctions and since he was speaking to them, and not a modern audience, he did not necessarily reference everything and in great detail. So, unfortunately, unwinding the mess of it all can be pretty complex, that example of Indra is one of the ones that I am familiar with. I am sure that there are hundreds which I am not, yet which convey a far different meaning than one that can easily be gleaned with a modern eye that does not have these references. Now, what you say is true, that the Buddha was teaching about the weaknesses of the various religious practices of his day. However, the above does not say that Mara (that is, say, Satan) and Brahma (the Supreme Being) do not exist. It merely is implying that as long as the Buddha held fast to these ideas and conceptions that were the cultural vogue of the religion of his day, he was getting nowhere. It is not a negation of the existence of these beings. Just because there is a plane of consciousness in which there are no forms, does not mean forms can't exist, don't exist and it does not mean that God as a being does not exist. And, in the world outside of Buddhism, we have the testimony of Sri Krishna and all the Hindu saints, Moses and all the Jewish saints, Christ and all the Christian saints, and Mohammad and all the Islamic saints. And this is the testimony of thousands of people, over the course of thousands of years, expressing the existence of God. Are they all simply lying? Are they all simply deluded? There is absolutley no evidence to suggest either, quite the opposite. We can see this is the modern example of Mahatma Ghandi. He said that he heard a voice from God which directed him when to fast and for how long. Was he deluded? No, he was not deluded. He lived virtually his entire life in the public eye and never exhibited any mental illness. Was he lying? Again, his life is a shining example of some of the most extreme honesty ever exhibited in a human being. And, then, the assertions of all those hundreds of saints, over the course of thousands of years. No. The Buddha discovered the same reality that these saints discovered, but from a different path and methodology - and he used different language to describe these experiences. This is the testimony of the Indian saint Sri Ramakrishna, who practiced the paths of all the world's major religions and personally realised the goal of them all, and testified as to these goals being the same. And, as far as his veracity goes, he and his followers were recognized by Ghandi. Some of the Western followers later included Aldous Huxley, Dag Hammarskold - he had a very broad influence. There was some mysticism in the United States in the time of Emerson and mentions of the East. But it did not take hold. Swami Vivekananda, of the Sri Ramakrishna mission, came to the US (and Britain) around the turn of the century and is one of the first, if not the first practitioner of Eastern religion to really establish a foothold in the West. Everyone of us with interests in Buddhism owes him a debt (and by the way, even though he was a Hindu, his favorite saint was the Buddha). How does the "supreme god" concept fit into the Buddha's insight of impermanence? It is about form and non-form. To attain to the state of nirvana, one must transcend all form. You can read more about this if you read the relationship between Sri Ramakrishna and Totapuri. Totapuri was a wandering non-dualist monk. Sri Ramakrishna was a devotion saint, who decided to personally practice the disciplines of all the major religions to see if they produced the same result, including non- dualist practices. So, a form is a limited construction. But Sri Ramakrishna said, that if consciousness is an ocean, if some takes a form as an iceberg, that does not mean it is distinct from the ocean (the direct quote is much better). If one is meditating and trying to break through the final boundary and release oneself into nirvana, it is there that attachment to form becomes a problem. People have interpreted this to mean that Buddha said God did not exist. They are wrong. How does the "supreme god" concept fit into the Buddha's insight of non-self? there is the mind, the intuitive mind, the overmind... the astral body, the casual body and then, beyond that... the "non-self" is not a negation of soul, it is a negation of the limited connection of ego to soul, which is not the true (or unlimited) being. How does the "supreme god" concept fit into the Buddha's insight of dependent origination? If someone wants to be a theist then be a theist. Why try to fit theism into Buddhism? I really don't understand. The problem is, is that people meditate and gain some clarity and think it is nirvana. Others go farther and gain some light during meditation and think it is nirvana. Other go farther and get to a place where they can truly transcend many negative qualities and have light and compassion and all kinds of spiritual qualities...and yet, it is not nirvana. The problem is that people accept limitation. They don't try for the highest branch because they stop at a limited experience. "I WANT TO SEE THE BUDDHA"